Las Vegas, NV—Realizing that they are sitting on a renewable energy gold mine, public officials in Nevada—the Silver State—have begun celebrating and profiting from their renewable energy resources. Surpassing California, the state is now the nation’s number one producer of both solar and geothermal power per capita. Nevada owes much of its success to the adoption of a state tax abatement program in 2009 that has generated nearly a 1,000 percent return on the investment. Speaking at the ninth annual National Clean Energy Summit in Las Vegas, Nevada Governor Brian Sandoval said that the “$734 million in incentives has attracted a return of $7 billion in capital investments, payroll, and taxes paid.” Read more here. Photo: Former U.S. 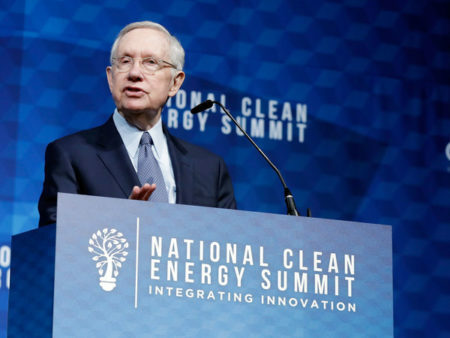 Senator Harry Reid by Isaac Brekken / Getty Images for National Clean Energy Summit. 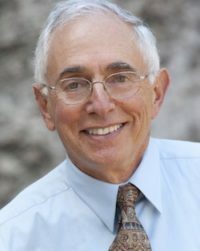 About the Author: John J. Berger is an energy and environmental policy specialist who has produced ten books on climate, energy, and natural resources topics. 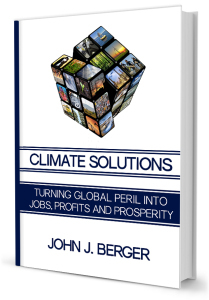 Forthcoming Book: Climate Solutions: Turning Global Peril into Jobs and Prosperity will show that a massive clean-energy investment program will produce millions of new jobs over a decade while generating trillions of dollars in savings. Climate Solutions presents compelling evidence that we can restore economic vitality by building a new, clean energy system for America. Imagine having low unemployment, healthy economic growth, affordable energy, a clean environment, fewer entanglements with the Middle East, and secure domestic power supplies at predictable prices. Building this new renewable energy system is the most effective step we can take to protect our economy and our climate. Click here to read more and to sign up to receive an email when the book is available to preorder. This entry was posted in NewsBlog and tagged climate economy, Climate Solutions, John J. Berger, National Clean Energy Summit, Nevada's investments in renewable energy, Nevada's tax abatement program, The Huffington Post on December 9, 2017 by Helen Deffenbacher.